Pumps of these series are used in small systems and in the ship building Industrie. We have small base series, which are extended with a number of special types according to system requirements. 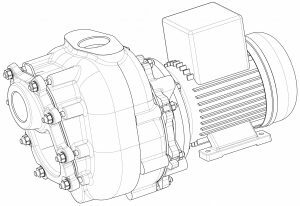 The pumps are as compact as possible and can therefore also be integrated into very small units. The pump series EBP and SAP are used in very different applications and are detailed further on the following pages. The built-in pumps series EBP are extremely compact, small centrifugal pumps in different designs. 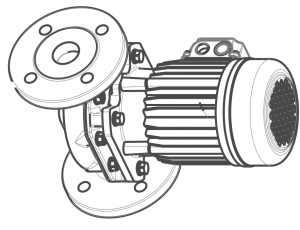 The standard version has a housing with integrated wear plate and a semi-open impeller. Due to this design impellers with very narrow channels for small flows can be realized. As a special form a small line pump with standard motor is available. This pump is used in devices in which due to vibration or media temperatures canned motor pumps cannot be used. The use of simple cast iron up to high corrosion resistant special materials allows a wide range of applications for the pumps. The built-in pumps series LD/S and ME are extremely compact, small centrifugal pumps in different designs. The pumps are equipped with an semi-open impeller which work against the casing surface with a small distance. With that we get an open geometry which is suitable for handling of dirty and fibrous material containing liquids. The pumps are generally produced from stainless steel and can therefore be used for various applications. The self priming pumps series SAP are able to evacuate the suction line itself, when the possibility of venting via the pressure line is given. The series currently consists of only very few types which can be delivered with different connection sizes. The SAP-S 25-125 is equipped with a cutter device, which can cut down shredable particles. This version is also used for conveying of waste water. The open impellers run against a wear plate and can convey liquids with particles and are mainly non-clogging. The use of simple cast iron up to high corrosion resistant special materials allows a wide range of applications for the pumps.